A friend in Italy was talking about the new Ferrero Pocket drinks have changed their taste this year. The wha? 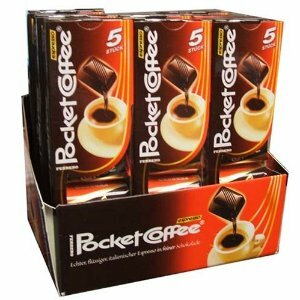 Ferrero Pocket Coffee is a bittersweet chocolate tasting exactly like an Italian espresso. 3 pieces of Pocket Coffee is equal to 1 Cup of Espresso. The chocolate taste Like a liquor chocolate, but with strong espresso in the middle instead of liquor. Pocket Coffee is a delectable combination of espresso filled dark chocolate that combines a gourmet chocolate experience with an authentic espresso taste and energy boost.